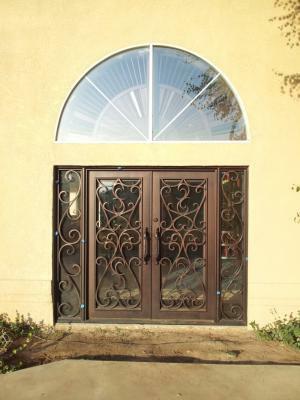 Above are two custom wrought iron entry doors installed in the area near Fresno, Clovis and Madera, California. These unique iron entry doors replaced an outdated front door and a standard glass slider back door and completely transformed this home’s exterior. The matching hand forged scroll work dresses up the simplicity of the architecture and to complete the overall look we can build custom wrought iron garage doors with a matching design. 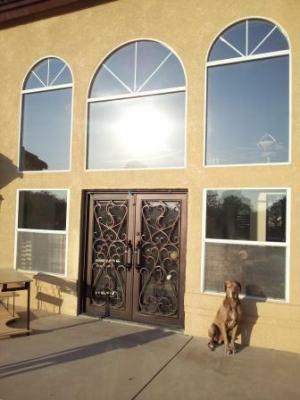 Signature Iron Doors is the leading manufacturer of quality custom iron products, creating custom iron front doors, custom iron garage doors, wrought iron railing and ornamental iron gates. We specialize in custom iron work matched with great customer service. Click here to visit our website and see the numerous iron products we produce and contact us to see how we can help you transform your old front door or wood garage door into a beautiful piece of forged Iron artwork.